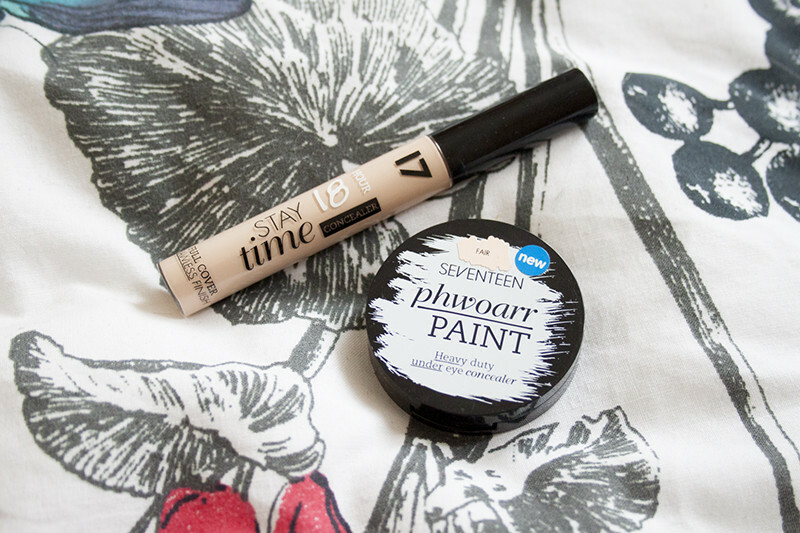 Today I'm coming at you with a review on two Seventeen Concealers in the form of the Seventeen Stay Time Concealer and the Seventeen Phwoarr Paint. I thought I'd give them a whirl as my usual drugstore concealer, Collection Lasting Perfection Concealer, has once again been used up. I cant get enough of it's budget friendly awesomeness. My local Boots back at my Mums doesn't actually stock collection so I thought fast (and thought about reviews I'd recently seen) as to which ones I should give a go. I find the Seventeen Phwoarr Paint to be quite thick, paste like concealer. You apply it with your fingers and tap under the eye to blend. It's very thick and creamy but doesn't look or feel cakey on application. It's seriously heavy duty, and I find it does crease slightly under the eyes, so you do need to set it with a powder. It's not one for dry skin so I would recommend using a good eye cream prior to application. On the upside, It's easy to blend, covers flawlessly and really hides any unsightly discolouration. I tested this on some spots as well, and it gave excellent full coverage. The Seventeen Stay Time 18 Hour concealer reminds me a bit of the Collection Lasting Perfection, the packaging is very similar, and it feels the same on the skin. It covers spots, under eyes circles and any discolouration. I cant work out if this is just Seventeen's version of the Collection concealer, they seem to do exactly the same job in my eyes! I think its a bit thinner than it's Collection counterpart but is slightly less matte. It covers well and doesn't feel drying or cakey while blending easily into the skin. Overall I think I prefer the Collection Lasting Perfection to the Seventeen Stay Time Concealer. But the Stay Time is a good budget friendly option if you cant get hold of the Collection one. I also give thumbs up to Seventeen Pwhoarr Paint, and actually I think I'll continue to use is as long as I'm using it correctly with eye cream and powder. It's heavy duty and works wonders and covering my bags! Plus it's super long lasting so touch up's are minimal. Do you like the sound of either of these?